Three piece Lancaster/Ulverston band Paddy Garrigan and The Stroller Priests launch their debut album at the Gregson Centre in Lancaster this weekend. 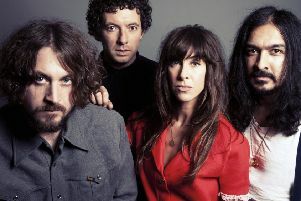 The band features songwriter Paddy on guitar, mandolin, banjo, harmonium and piano; Ben McCabe on drums, french horn and backing vocals and Darren Leadsom on bass and backing vocals. They will be joined by special musical guests Pete French on keys, Avent Deux on shawm, hurdy-gurdy and accordion and horn section Burst Horns to help them recreate the album. Sea monsters, James Joyce, the afterlife, Dad’s Army, the stoned freaks in the town centre and the universe blues are just some of the stories that await the listener, set to a deftly musical soundtrack of runaway grunge, barreling rock’n’roll, mandolin dub, melodious folk and epic guitar heroics. According to Horrible Histories, a stroller priest was a disreputable man of God who roamed the roads of medieval Britain and could be called upon to perform various religious duties for cash. The band’s debut album I Jumped Ship was self-produced over a two year period, recorded and mixed by Darren. In addition to the band themselves, the songs feature Ben’s extra-curricular wind quartet Burst Horns, who add parping and pumping horns arranged by Ben to four songs. The all-male singing group It’s A Man Thing appear on Sea Monsters, adding boozy bar-room harmonies to the song’s call and response lyrics. A unique 100-year-old harmonium emerges in two songs, the epic narrative of an avaricious man Now I Want More and the delicately atmospheric The Honey Mead, linking the modern and witty tone of the band’s songs to the traditional folk of Paddy’s deep musical roots. Support at the gig on Friday, April 29, comes from Joanne Levey and Family Selection Box. Entry is £5 on the door and the album will be on sale at the gig.